Abraham planet a tamarisk tree at Beersheba and there he called on the name of the Lord, El Olam – the Eon God. How does God bring about his plans through the eons? Can demons and the self-willed thwart his plans, some of which have existed since before the creation? The angels existed when God laid the world’s foundations (Job 38:4-7). However, God did not create evil. Lucifer was blameless in his ways until the day unrighteousness was found in him. He was the most beautiful and greatest in rank of all God’s creation. Then Satan’s pride in his exalted position brought him down. (Ezekiel 28:13-16 and Isaiah 14:12-14). God: Lucifer, for your sin of pride you will eventually be tormented in the fire (Matthew 25:41). Lucifer: Pride is a minor thing. Yet you charge me with high offense (Job 4:18). Your punishment far exceeds my offense. God: I know good and evil (Genesis 3:22). I know how sin grows and spreads. What you have done will spread. I predict that in the end your evil ways will grow until you bring destruction, ruin, death and misery on the prefect universe I created. Lucifer: You are judging me for future things I have not done. You are overwhelming in your power. You are a judge without leniency or mercy. I have assembled the hosts of heaven and one third of the angels side with me (Revelations 12:4). God: I have created creatures of the dust who are in my image and after my likeness. I plan to use the humans to display my boundless mercy and justice. Lucifer: Let me talk to those creatures of the dust . . . (later) The clay models of yourself have come to know good and evil. How can you use them to display your mercy when they are now following me and must answer to your justice? I demand that you return them to the dust, since they ate the forbidden fruit. God: I myself will resolve the conflicts between justice and mercy. I myself will save them. I will give my redeemed ones new bodies, better than dust bodies. I will be praised by those whom I redeem from your rebellious kingdom and give them a status higher than yours, as my children. They will demonstrate that I am a God of love and mercy and they will judge you for what you have done to them (1 Corinthians 6:3). I will crush you under their feet (Romans 16:20). In the above scenario, it is not necessary to imagine that God sees the future or that he is responsible for evil, as though time (the future) actually exists. A Christian trained in Augustinian theology, might say “You are taking away from God’s majesty by claiming He does not see the future.” On the contrary, I am giving him much greater glory. He is sovereign. He makes trillions of sovereign choices every day with respect to nature, angels, demons and people. He makes fools of the wise who refuse to honor Him as creator. He certifies that the sinner is enslaved by his own sin. Yet He also chooses some whom He will save. Even as Savior, He is gracious, since He answers the prayers of His children to save their loved ones as well. A God who moves history in the direction He predicts, without ever lying or doing evil, is vastly more powerful than a God who merely sees the future. What is the point of all this story? Time has no existence, either for man or God. 1. Long duration events exist in our mind. Time has no actuality. 2. Time is merely a symbol for counting, like numbers. Thirty five hundred years ago, people did not imagine that time exists or is measurable. Their calendars were dynamic and adjusted to fit the changes observed in nature. They saw never ending changes in the very place westerners imagine fixed duration time. 3. All ancient people understood earth history non linearly, as did the biblical authors. They believed that days and years continue to shorten (Genesis 47:9). To understand Earth history with the accelerating days and years of the ancients is to see creation as it actually exists. By God’s command the plural eons formed passively out of things not seen (Hebrew 11:3). We can see in galactic history the very things God says He repeatedly did and continues to do in the heavens as the Sun, Moon and stars continue to spread out from things not seen. Billions of star streams form and spread out from unseen things, the unformed matter in the core of each galaxy. 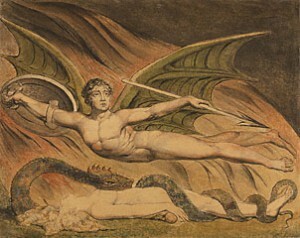 William Blake, made this pen and water color of Satan exulting over Eve in 1795. It is in the J. Paul Getty Museum.